Indeed, if a little knowledge is dangerous, where is the man who has so much as to be out of danger? The activities surrounding the program could not be totally concealed from the public, however, as the firing of launch vehicles into orbit tends to attract attention; its existence therefore not only needed to be kept from adversaries, but also from the domestic population, necessitating the creation of cover stories. 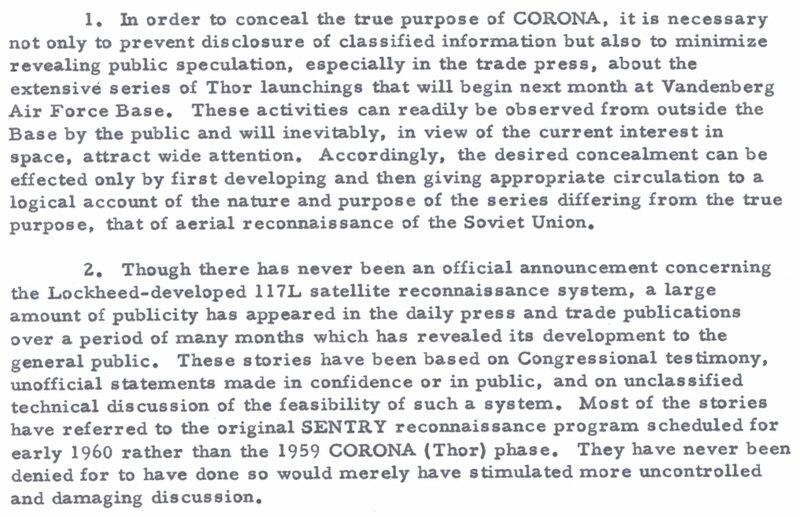 Credible explanations were necessary to assuage the curiosity of both the press and the public in order to maintain the “security” of Project CORONA. A 1958 memo [PDF] from Bissell summarizing a plausible cover story explained that the “desired concealment” could only be achieved by “first developing and then giving appropriate circulation to a logical account of the nature and purpose of the series differing from the true purpose.” Such a strategy required that a “minimum amount of information be released,” as denying the press any details “will not only invite a penetration effort on the part of the opposition but create an air of mystery and encourage damaging speculation.” CORONA could be portrayed as an activity serving “a number of legitimate scientific and technical purposes,” which, though possibly “contributing to the development of military technologies,” were not “military in character”; false, or decoy, payloads were to be carried on certain launches “so as to ‘live out’ the cover story.” Any involvement on the part of the intelligence community (IC) was to be concealed. What’s more natural than to conceal these activities, the disclosure of which would jeopardize vital national security interests? Moreover, they understood that in order to keep a secret from one’s adversaries, the domestic population also had to be kept in the dark, as revealing the truth to the U.S. population would be tantamount to revealing it to the Russians as well—unacceptable. Moving to 1983, President Reagan signed National Security Decision Directive (NSDD) 108 [PDF] on October 12, pronouncing the need to respond to the Soviet doctrine of maskirovka, which called for “camouflage, concealment and deception” surrounding defense-related programs; measures designed to mislead or deceive included “concealment, simulation, diversionary actions and disinformation.” U.S. planners were concerned that the Soviet Union “may be attempting to deceive the West regarding the intent and purpose of basic policies, e.g., arms control.” Clearly, outwitting such perfidy required a more “aggressive and focused” intelligence program, devoting training and resources to countering Soviet attempts at obfuscation. 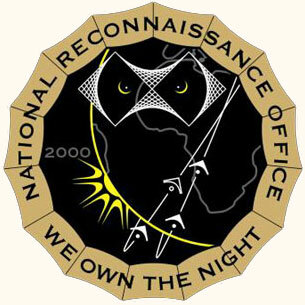 The document was to be handled through TALENT-KEYHOLE control channels—a compartmented security designation to protect material/intelligence obtained from manned aircraft overflights and reconnaissance satellites—meaning the implementation likely included the development of new techniques of satellite surveillance. You are currently reading Camouflage, Concealment and Deception at DogmaDrift.